But anyways, this blog post isn't about Shufflepuck Nostalgia, it's about taking things too far while playing LEGO with your kid. 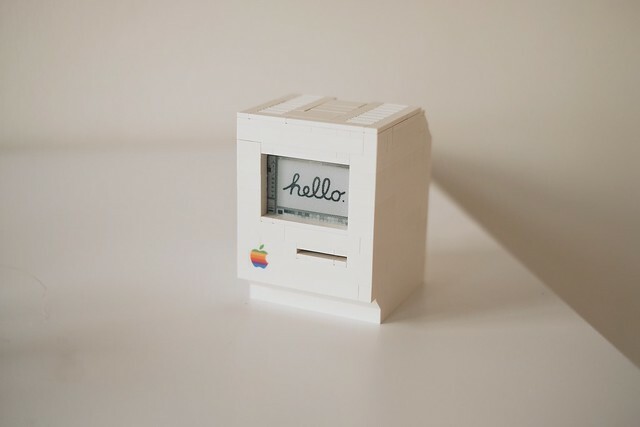 The overlap on the right side of the display is quite small, but on the left side more than 10mm of board needs to be hidden inside the case of the LEGO Macintosh. I could only think of one solution: Get ahold of a Dremel and cut into the LEGO to make it fit with a border of only 2 bricks. Should be simple enough. Unfortunately, you can't order pieces right out of LDD. But it lets you print a list of pieces which, I thought, is good enough. When trying to order them one by one I realized that not all bricks that you can use in the LDD are actually available in all colors online. Since this project was a birthday gift for a buddy of mine, I didn't have the time to do more research and ordered the blocks in white right off lego.com. Note how on the left side there's almost no plastic left. Putting the rest together was straight forward. Now all I had to do was connect the e-paper display to the Raspberry Pi Zero and off weeeeee go! For a hardware dilettante extraordinaire like me, connecting the e-paper display to the Raspberry Pi Zero was a little tricky. The reason was space. Normally, you can just connect the display to your Raspberry Pi with the ribbon cable. That doesn't work in this case (see what I did there? ), though, so I had to figure out which pin of their 14 pin serial expansion connector goes to which GPIO pin of the Raspberry Pi. I am guessing that only the VCC/GND and SPI pins need to be connected, but I don't know for sure - I connected all of them. If one of you knows enough to validate this, perhaps we should submit it to the fantastic pinout.xyz! If you closely look at the photo above, you see a little erect thing connected to the Raspberry Pi Zero in the background. That little thing is the inside of the Raspberry Pi WiFi USB dongle. Of course, right after I purchased the Zero, a version with Wi-Fi onboard was released: the Raspberry Pi Zero W. Anyways, I followed this beautiful tutorial. Unless you want to solder, I would recommend just buying the Raspberry Pi Zero W. It takes up less room and comes with bluetooth, too! Remember I said this little project is a trojan horse birthday present? That's right! It's going to be deployed in the field, at my friend's place, far away from me without the possibility of physical access. So how would I go about updating the code that puts useful information on the little Mac's screen? While playing with Docker on the Raspberry Pi, I came across the great ARM docker base images from the folks over at resin.io. After checking out their service I realized they do just what I was looking for: they're like a Docker Cloud for the IoT. There's a flickr album with more photos of the finished product and the making of. Thanks for reading! Have comments? Questions? Know more cool Macintosh projects I should list here?